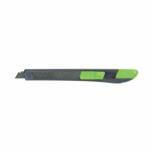 Q-Connect Medium Duty 18mm Cutter M80BC Pack of 1 Q-Connect Medium Duty Cutting Knife features a locking device and slit tail piece for snapping off blunt blades. 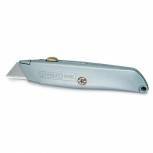 Refill blades are available see KF10636. 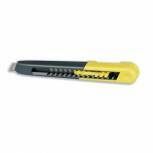 Stanley Knife Retractable 0-10-088 Pack of 1 Stanley retractable blade utility knife. Fine adjustment allows 5 blade positions. No tools required when changing blades. 150mm long. Stanley Fixed Safety Knife Blades (Pack of 10) 2-11-987 Pack of 1 Replacement blade for Stanley fixed blade knives. Designed for added safety. Designed to cut with a high level of precision. Blades keep their edge for a long time. Provides a clean and sharp cut. Pack of 10 blades. 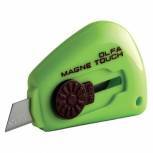 Olfa Magnetic Touch Knife 841502400 Pack of 1 Olfa Magnetic Touch Knife TK3M. This pocket-sized, multi-purpose knife features a stainless steel blade, magnetic back, easy-slide lock and hanging hole to easily slide on to your key chain. Ideal for use in arts, graphics, crafts and hobbies. Stanley Knife Retractable 99E 2-10-099 Pack of 1 Die cast metal body, shaped for comfortable grip. Amount of blade extension can be controlled by blade shifter. Supplied with 5 assorted blades. 9mm. Finish - Charcoal. 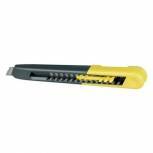 Q-Connect Heavy Duty 18mm Cutter 68BC Pack of 1 Q-Connect Heavy Duty Cutting Knife features a locking device and slit tail piece for snapping off blunt blades. Refill blades are available see KF10636. 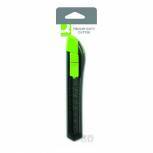 Q-Connect Universal Cutter Blade (Pack of 5) KF15433 Pack of 1 Universal cutter blade for precision cutting. Blade keeps edge to ensure performance. For precision cutting. For use with Universal Retractable blades. Supplied in a pack of 5. 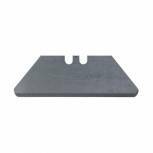 Q-Connect Medium/Heavy Duty Cutter Blades (Pack of 12) KF10636 Pack of 1 Q-Connect Cutter Blade Medium/Heavy Duty Pk 12 44L12TBL All knives have locking device and slit tail-piece for snapping off blunt blades. Replacement blades available. Not for sale to under 18's. 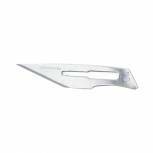 Stanley Knife Snap-Off Blade 9mm 0-10-150 Pack of 1 Quality snap off blade knives with integral blade snapper and blunt blade storage built into the handle for added safety. Precision ground blades made from high quality steel. 9mm knife. 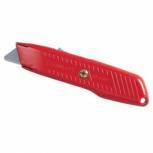 Stanley Safety Spring Back Knife 0-10-189 Pack of 1 The safety spring back knife has a red high visibility body which is ribbed to provide a firm grip. The blade automatically springs back inside the knife body as soon as pressure on the shifter button is released. 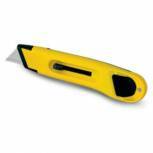 Stanley Disposable Knife Carded (Pack of 3) 0-10-601 Pack of 1 Stanley all in one disposable knife. Ensures that you do not have to constantly change your blade. All in one construction for convenience. Simple alternative to retractable blade knives. Durable plastic chassis. Pack of 3 knives on blister card. 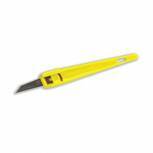 Stanley Knife Snap-Off Blade 18mm 0-10-151 Pack of 1 Quality snap off blade knives with integral blade snapper and blunt blade storage built into the handle for added safety. Precision ground blades made from high quality steel. 18mm knife. Q-Connect Light Duty 9mm Cutter 120BC Pack of 1 Q-Connect Light Duty Cutting Knife features a locking device and slit tail piece for snapping off blunt blades. 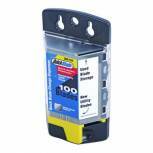 Refill blades are available see KF10635. 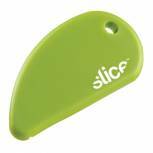 Slice Safety Cutter Green 00100 Pack of 1 Slice Safety Cutter Green 00100. Rubberised non-slip surface. Ceramic blade stays sharper for longer and is resistant to rust. Built-in magnet. Key ring hole. Suitable for both left and right handed use. 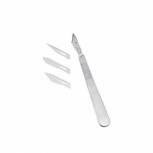 Swordfish Scalpel No.3 Handle With 4 Blades Metal 43110 Pack of 1 Swordfish Metal Scalpel. Metal handled scalpel with removable/disposable blade. This professional scalpel is stylish and comfortable to use, with superior performance for accurate cutting. Blades are non-sterile. NB: Blades not included. Swordfish Scalpel Blades No.10A Metal (Pack of 100) 43802 Pack of 1 Replacement Swordfish ProScalpel blades. Designed for use with Swordfish ProScalpel No. 3 handle. Small and straight No. 10A blade. Ideal for accurate cutting of paper and card. Non-sterile blades: hobby and technical use only. Pack of 100 blades. 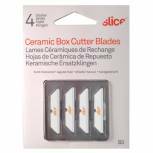 Slice Blades For Box Cutters 34mm (Pack of 4) 10404 Pack of 1 Slice Blades for Box Cutters 34mm Pack of 4 10404. For use with SLC10512 and SLC10513 box cutters. Double sided ceramic safety blades with rounded edges. Stays sharper for longer than metal blades. Resistant to rust. J Handle Red Slice Box Cutter / Knife 10400 Pack of 1 Slice Box Cutter Red 10400. 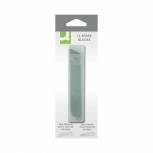 Double sided ceramic safety blade with rounded edges. Stays sharper for longer than metal blades. Resistant to rust. 3 position manual slider button. Unique handle protects hands. 178mm long. 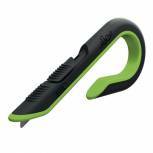 Slice Box Cutter Auto Retractable Green/Black 10503 Pack of 1 Slice Box Cutter Auto Retractable 10503. 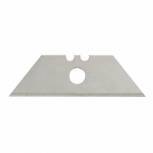 Double sided ceramic safety blade with rounded edges. Stays sharper for longer than metal blades. Resistant to rust. 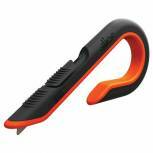 Unique handle protects hands and has a rubber grip for comfort. 178mm long. Black and green.